RUSH: I could play you any of a number of sound bites of me in recent weeks to illustrate this, but let’s go back to January 4th, right here on this program. A couple of weeks ago I predicted, but also last year, about the objective that Obama has. RUSH ARCHIVE: I’ll tell you what’s on tap here. The Democrat Party and Barack Obama, particularly Obama, Obama has a lot of admiration for Reagan, in a political sense, not policy-wise. Obama’s admiration for Reagan is in the sense that Reagan was a truly transformational president. Reagan genuinely changed the trajectory of this country. He changed the overall foundation of this nation and its economy with Reaganomics, supply-side, trickle-down, whatever you’re gonna call it. Now, Obama hates that, he hates Reaganomics. He wants to be as transformational a president as Reagan was, and what he seeks to do is erase every trace of Reagan from America, and particularly economically. RUSH: So whereas the Reagan transformation of the country, the trajectory that Reagan moved our country to was one of conservatism, one where the trajectory was toward smaller government, lower taxes, private sector boom determining whether or not the economy was growing, government deemphasized — Reagan didn’t get a lot done in terms of shrinking government. He wanted to, obstacles everywhere. Is a very tough thing to do, but we were moving in that direction. And more importantly, the voters were of that mind. Reagan won two landslides on the premise that government was the problem, that government had to be deemphasized in people’s lives, that people’s lives were improved greatly by virtue of their own self-investment and self-worth. Obama wants no part of that. He wants to eliminate that. He’s written about Reagan and his minions, quote, unquote, in his books. He’s been openly disdainful of Reagan’s policies. He’s been very admiring, though, of Reagan and what he was able to do. And so Obama now wants to codify an exact opposite transformation and a trajectory toward government being the central thing in everybody’s life. That everybody’s life will be Julia, that cartoon. That every meaningful step in an individual’s life will occur after an interaction with government. That the citizen will basically turn his life over to the government, turn his prosperity, to the extent that he’ll have any, his security, his economic well-being, will be turned over to the government. This is what Obama seeks. I first mentioned this in the last three months of last year, when, to me, it became obvious that this is what Obama’s objective was. And, of course, this is an objective shared by many in the media. Now, I mentioned that the political director at CBS, John Dickerson, had written a piece. Here it is. The CBS political director has written a long piece for consumption by Obama in which he says that Obama’s only option is to pulverize the GOP. He must declare war on the Republican Party. “The president who came into office speaking in lofty terms about bipartisanship and cooperation can only cement his legacy if he destroys the GOP. If he wants to transform American politics, he must go for the throat.” This, the political director at CBS News, destroy the GOP. That’s what Obama has to do. Now, Obama doesn’t have to be told by the political director at CBS. Obama is oriented to doing that anyway. My point here is not that Obama’s getting advice from these guys and taking it. He doesn’t need their advice. The point here is, this is your media. This is who they are. This is what they want to happen. This is what they are advocating, and this is what they will support. This is what they will attempt to make happen via their reporting. If Obama’s legacy depends on the GOP being destroyed, they’ll take care of it. They’ll do everything they can. They’ll take out Rubio. They’ll take out whoever they have to. I’m sure Mr. Dickerson and everybody else in the media has been articulating that pabulum about civility and bipartisanship, cooperation, and working together, and how we must do that. The American people are fed up with the constant bickering. And here comes a guy, political director CBS, has no doubt gotten in his share of thoughts on civility, now advocating pulverizing the Republican Party, destroying the Republican Party, going for the throat. So what does that mean? What Mr. Dickerson is suggesting here is he’s saying to Obama, “Look, what you and I working together need to do is get rid of conservatism. And to do that, we must define every Republican as being nothing but pro-gun, wants as many guns as he can get and wants to shoot guns all the time. Wants to shoot guns every day. Doesn’t care about Sandy Hook. This is a guy that will protect anybody’s right to have a gun and shoot it, so we want to portray ’em that way. And then we’re gonna go out and we’re gonna portray ’em as the equivalent of Holocaust deniers if they say that there isn’t any manmade global warming.” It’s already a hoax. It’s already been established there isn’t any manmade global warming. Doesn’t matter. In order to destroy the Republican Party with the low-information voter crowd, we’re going to have portray ’em. And, Mr. President, we’ll be glad to help you out here. We’re gonna do it. We’re gonna portray every conservative as a madcap lunatic, insane gun activist who likes mass shootings, and then we’re gonna portray ’em as some of these archaic old antiques who don’t think that there’s any warming going on, and then we’re gonna portray ’em as a bunch of they want nothing but deport every Mexican in the country, and we’re gonna portray ’em as people that want to cut taxes for the rich. In other words, Mr. President, you need to continue if you want to destroy the GOP and pulverize ’em. If you want to transform the country, we here at CBS will help you by defining your opposition the way he is just described it. Everybody’s gonna be a southern hayseed Deliverance kind of insane hick. The objective of this is to make as many Republicans as possible renounce conservatism. It’s designed to make every Republican who doesn’t like conservatives anyway run away from ’em as fast as possible, because he’s not gonna want to be thought of the way conservatives are gonna be portrayed by Obama’s friends at CBS, ABC, CBS, CNN, you name it. He says, the NRA has overreached, Mr. President. We can use that. The president is also getting help from Republicans who are calling out the most extreme members of the coalition, like Chris Christie. Mr. President, you need to form more alliances with Republicans like Christie, who’s doing everything he can to help destroy the Republican Party, just like you want to do, and we’ll help. We’ll build these guys up, Mr. President. We’ll find every Republican who’s actually a Democrat, and we’ll make ’em out to be the biggest stars in the world. This is what the CBS political director is advocating and promising. And then Mr. Dickerson writes, “If the Republican Party finds itself destabilized right now, it is in part because the president has already implemented a version of this strategy.” Right. Pulverize, destroy, go for the throat. Now, folks, in politics, I’m not complaining this is happening. I don’t want anybody misunderstood. This is like complaining about the competition in capitalism. You can’t. If you like capitalism, you’ve got to love the competition. And you’ve gotta understand it’s gonna be go for broke. Well, political competition’s the same way. My point to you here is that we now have, without any question, Obama’s real objective is not just Obamacare. It’s to eliminate any political opposition, to just wipe them off the map, and the media is now telling him not only will they help, but they’re offering advice on how to do it, openly. So those of you who are continually waiting around for the media to be fair and get the story right, you’re gonna forever, as I have also warned you, be disappointed. And then over at Slate.com, they talk about this piece by Dickerson and add to it. Yep. Obama must destroy the GOP. RUSH: Menlo Park, California. Hi, Rich. It’s great to have you on the EIB Network, sir. Hello. CALLER: Hi, Rush. Thanks for having me on. You know, they are the Republican Party, and they fold every chance they get. And as an American who’s watching this who used to believe in the Republican Party, I get so angry that they do this to us. They said that the taxes are off the table and then all of a sudden we find out, “No, no. They’re not off the table.” You know what, Rush? It’s all theater to keep us engaged. I don’t think they believe a word of it. I think they just go along with what the Democrats are saying in order to maintain their little piece of power. That’s my feeling on it. It’s unbelievable to me. RUSH: Well, I know. This has been the case for many years. CALLER: The Republicans, they’re the ones who gave us Obama, essentially, with all the spending that Bush did, and McCain and the Gang of Six that took away the long-term tax breaks and gave the ten-year Bush rates which drove us to the fiscal cliff we’re at now. RUSH: What you’re saying about the Republicans is not new. That’s been the case basically since the nineties. That’s not what I’m really talking about here. Maybe you missed my point. I’m sorry, I guess I didn’t explain it properly. The point of this is not to complain about the Republicans. They’re who they are. RUSH: I’m gonna stick with this, ’cause as I said at the top of the hour in the first hour of the program, the last hour, I have been issuing predictions — warnings is what they’ve really been — for the last two or three weeks intensely and the last three months of last year about what’s happening, what’s headed our way, where we’re headed, what’s coming our way. I don’t mean this in some sort of, “Hey, look at me! I’m right,” way or people are stealing what I’m saying. It’s not that. It’s that, you know, we’re always looking to expand our audience here. I want people that listen to this program to understand that they can trust what’s said here, and this whole notion now the media has joined in with, “We gotta wipe out the Republicans. We have to pulverize them! We have to eliminate them!” The point of that is not what happens to the Republicans, and the point of that is not what the Republicans have or haven’t been doing. It’s not that they are lying or not being honest on what they’re going to do. That’s not the point of this. The point is, at least in my lifetime, this has never happened. I have never, ever seen an open — so wide open — admitted-to association between a political party and a so-called news media that exists for one reason, and that is to eliminate, to wipe out, to pulverize everything I believe in. That’s never happened. That, to me, is the point, not whether the Republicans have any guts. People have been calling here for 25 years, “Why don’t the Republicans do this or say that?” The Republicans are as afraid as anybody. The Republicans are scared to death, folks. They’re afraid that Obama’s gonna come for ’em one way or the other. Everybody’s afraid. That’s why the Republicans are doing what they’re doing. That’s why certain conservative media is saying what they’re saying. Everybody’s scared to death of Obama. I’ve never had this happen in my lifetime. I’ve never been alive where there is a genuine, visceral fear of action by government against individuals. We know that various presidents have targeted ideas, Big Oil, Big Pharmaceutical, that kind of stuff. That was bad enough. We’ve had the demonization of capitalism. You have individuals who are scared to death that this guy’s gonna come after ’em, in the United States of America, and everybody’s atwitter today because Beyonce lip-synched the National Anthem? By the way, that John Dickerson, the CBS political reporter, his story didn’t appear at CBS. It appeared in Slate.com. And you know what? I’d almost say, based on Dickerson’s piece — and I quoted from it. I gave you excerpts last hour. I wouldn’t be surprised if he had seen Obama’s inaugural address in advance before he wrote that piece. I mean, that piece was a companion piece to Obama’s inaugural address, and it was a blueprint for what Obama wants to happen, and we’re witnessing it. 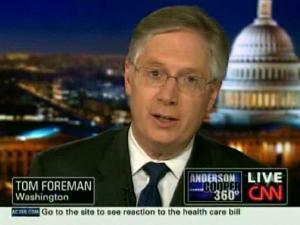 Now, The Daily Caller has the story about Tom Foreman. Now, many people never heard of Tom Foreman. He’s a reporter at CNN, and that’s why a lot of people have not heard of him. He wrote this: “Inauguration Day will signal the culmination of an effort I launched on January 20, 2009, to write a letter to the White House every single day of Barack Obama’s first term. “And I do mean every day. Weekends, holidays, when he was on vacation, and when I was on vacation. I wrote in my office, at home, in moving airplanes, cars, trains and even while running through the woods. I wrote early in the morning, in the middle of the day and late at night. I wrote … 1,460 letters, well over a half-million words, or enough to fill about seven novels.” This guy, a journalist, is admitting he wrote letters to Obama every day, and he never got a reply. “CNN Reporter…” That “reporter” should be in quotes. “CNN Reporter Writes Letter to Santa Claus,” and these are groupie-type letters. Here’s F. Chuck Todd. 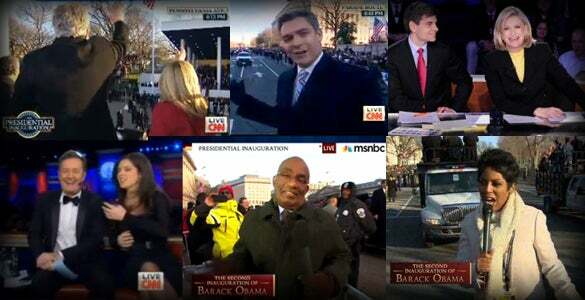 This is yesterday afternoon on NBC’s coverage of Obama’s second inauguration. TODD: One of the things that candidate Obama said he wanted to model himself after five years ago is when he said he was hoping to model himself more after a Reagan than a Clinton. And at the time, he was still running against another Clinton. And the point he was making was this: He thought Reagan, in a way, made conservatism mainstream, and so that’s what you heard in his speech today. This was an attempt to make progressive liberalism and move it into the mainstream. RUSH: Exactly. This is precisely it. Again, you who listen to this program knew weeks ago — or at least you heard a warning, in my opinion, weeks ago — that this is what Obama’s objective is: To be transformational. He admired Reagan not for what he did, but how he did it. He changed the trajectory of the country. Obama didn’t like Reagan, but the trajectory is changing. Now, the reason this is important, folks, to me is if I can see it, I don’t know why the entire conservative establishment in Washington can’t see it and why there isn’t any opposition to it. But there isn’t. All there is is admiration. All there is is daily reporting on it. Nobody’s doing anything to try to stop this is the point. It’s stunning. The Republican Party and whatever conservative wing it has is sitting by in a passive way, and they are watching themselves and what they believe in be targeted for elimination, and they’re not doing anything about it. Why is it that you have to hear somebody on the radio warn you about what’s happening, in a political sense, to your country? Where is the opposition to this? Not only is there not any opposition, there appears to be some real and genuine fear of speaking out against any of this. To me, it’s fascinating to watch. Jonathan Karl, our old buddy at ABC in his coverage yesterday. KARL: I felt during much of that speech like I was listening to a Democratic Ronald Reagan. Where Reagan was unapologetically conservative, this was unapologetically progressive, saying we must act collectively. This was also boundless optimism. I mean, saying America’s possibilities are limitless. This was an effort, I believe, at that kind of optimistic progressivism whereas, uh, Reagan was your optimistic conservatism. RUSH: Well, there is no “optimistic progressivism.” Progressivism is not based in optimism. Liberalism, “progressivism” is based in pessimism. It’s based in anger. It’s based in rage. It’s based in the belief that nothing’s just, that nothing’s fair, that nothing’s moral, that nothing’s equal, and nothing ever has been. Progressivism is rooted in the fact that everything in the world is wrong and has to be fixed, and the only people that can fix it are the people sitting at the top of the power pyramid in Washington. KRAUTHAMMER: There’s not a line here that will ever be repeated, but I think it’s very important historically, because this was really Obama unbound. And I think what’s most interesting is that Obama basically is declaring the end of Reaganism in this speech. Remember he once said that Ronald Reagan was historically consequential in a way that Bill Clinton was not. What Obama meant is that [Reagan] had changed the ideological course of the country. OBAMA 2008: I think Ronald Reagan changed the trajectory of America in a way that, you know, Richard Nixon did not and in a way that Bill Clinton did not. He — he put us on a fundamentally different path because the country was ready for it. RUSH: Right, and he didn’t like it. Obama wasn’t at all supportive of it. He hated what Reagan stood for, but he marveled at his ability to do it, and that’s who he’s been emulating. Yet nobody on our side seemed to care to emulate Reagan. In fact if you bring up Reagan, people on our side kind of smirk at you. “Oh, yeah, well, you can’t relive the past, Rush. You know, you gotta move forward. It’s a new era now. The era of Reagan’s over. You can’t keep going back to Reagan.” How many times have we heard that over the course of the years? Meanwhile, we sit around and watch the opposition use the techniques, tactics, what have you of Ronald Reagan to basically eliminate everything Reagan stood for.